I am posting information gleaned from land records in the areas where our family’s ancestors resided. You can read more about this project in the overview. You may also check my deed record listing, which I will update frequently, but probably not every day. This group pertain to early residents of Wexford County, Michigan with the surname Abbott. Papa’s second great-grandmother was Mary Jane Abbott; I have undertaken a study of the early Abbott deeds to look for connections to her and her family. I know that her brother Erasmus D. [E.D.] Abbott was in Wexford County, but have not connected any others to her at this time. I am shifting gears for on post to the Bureau of Land Management Land Patent records. Although I have found many of the purchases from the U.S. government later recorded in the local records, the two documented purchases by Erasmus D. Abbott have escaped my scrutiny to far. Before I cover deeds under which he sells property he bought from the US, I want to show the locations of the grants. I have found two at this time. The first, certificate #1312, issued 20 August 1873, application #2795 on for land described as: W1/2 of the NW 1/4 Section 10 T23N R10W. The other was certificate #1766, issued 1 November 1880, application 6162, for the #1/2 of the NE 1/4 Section 4, T23N R10W. Erasmus sold this land to his brother-in-law, Papa’s ancestor, George W. Burdick in 1874. I described this sale on at the beginning of my series. I do not understand the sequence of events regarding this piece of land. Erasmus D. Abbott appears to have sold it to Burdick before he actually held a title. It would be interesting to see the application, payment receipts and proof in the land patent file. However, since the price for the files is so high, I am not likely to order the fine any time soon. Perhaps Erasmus decided he owned the land as soon as he filed the application; then later realized he needed to file the final papers. Proof was required that the land was improved, and constantly occupied. Applicants typically noted the number of acres cleared, the permanent plantings made, the house and any other buildings. The also swore they had continuously occupied the land. Here are the location of the two pieces, marked on a thumbnail I created from the old 1889 Atlas1. 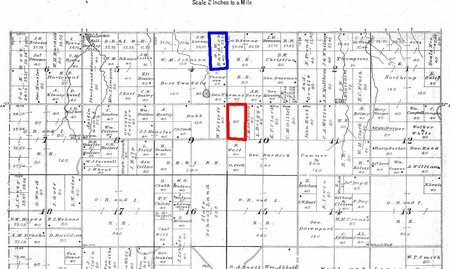 You can see George Burdick’s name on the land in section 4, marked in blue. E.L. Hayes & Co., Atlas of Wexford County, Michigan / compiled by Eli L. Hayes from government surveys, county and township records, and personal investigations and observations , Eli L. Hayes, (Chicago, Ill.: E.L. Hayes & Co., 1889), page 29; digital images, The University of Michigan. Michigan County Histories and Atlases. http://name.umdl.umich.edu/3928170.0001.001 : accessed 28 April 2010. I am posting information gleaned from land records in the areas where our family’s ancestors resided. You can read more about this project in the overview. You may also check my deed record listing, which I will update frequently, but probably not every day. This group pertain to early residents of Wexford County, Michigan with the surname Abbott. Papa’s second great-grandmother was Mary Jane Abbott; I have undertaken a study of the early Abbott deeds to look for connections to her and her family. I know that her brother Erastmus D. [E.D.] Abbott was in Wexford County, but have not connected any others to her at this time. Notes: Erasmus was Susie Burdick’s uncle. This is the same piece of land described on the deed I analyzed (to death) yesterday. That deed was dated 6 April 1875 and recorded 7 April 1875, and this one was three years later. I do not know if the Anson and Eliza Hanna on the previous deed were connected to Perry Hannah on this deed, but it seems likely. 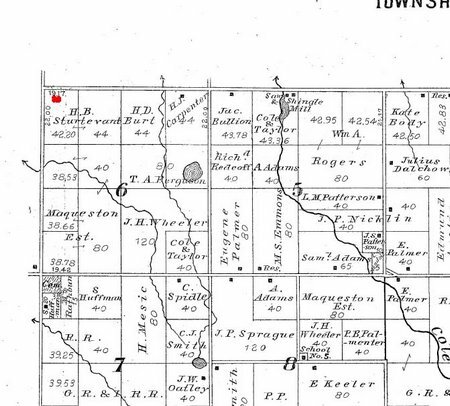 Here is the location, marked on the old 1889 atlas1, in case you do not want to look back. E.L. Hayes & Co., Atlas of Wexford County, Michigan / compiled by Eli L. Hayes from government surveys, county and township records, and personal investigations and observations , Eli L. Hayes, (Chicago, Ill.: E.L. Hayes & Co., 1889), page 37; digital images, The University of Michigan. Michigan County Histories and Atlases. http://name.umdl.umich.edu/3928170.0001.001 : accessed 28 April 2010. 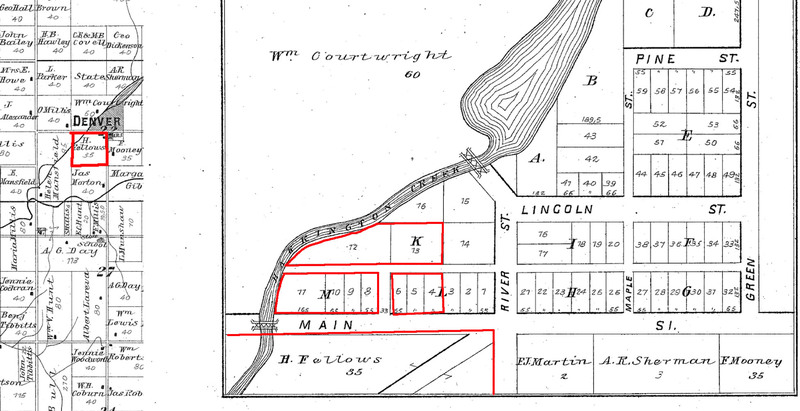 This piece of property is in or near Sherman, an early settlement in, and the first seat of Wexford County. I do not understand why the deed was not recorded until 1878, and I do not know if Abbott actually lived on this land, or used it in any way. I did fiddle around waste spend quite a bit of time looking at the area on today’s standard maps of Wexford County. The area is currently divided into lots, but none exactly match the description given on this deed, even after converting rods to feet. 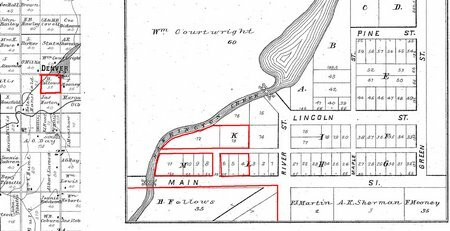 The best I can say is that the lot is located south of 14 mile road and north of East Church Street, between Sherman Street on the west and Nelson Street on the east. The land may have been redivided in some way, since no description starts 8 rods (627 ft) east and 22 rods (363 ft) south of the section corner. A rod is 16.5 feet. It is probably worth noting that this is a fractional section, where allowances were made for the earth’s curvature. Some other strange things seem to have been done with the survey, you can see that the forty on the edge of the section is actually 42.20, the the next two forts toward the east are 44 acres each. 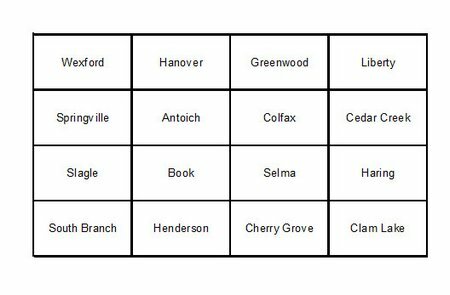 I would check out the edge of Hanover township that meets Antioch to see what the acreages there are, but I would get lost looking at fooling around studying the maps and spend another half hour hour doing something that really wouldn’t benefit my search for Abbotts in Wexford County. As illustrated on a portion of the old 1889 atlas1, the land is approximately where the red dot is. 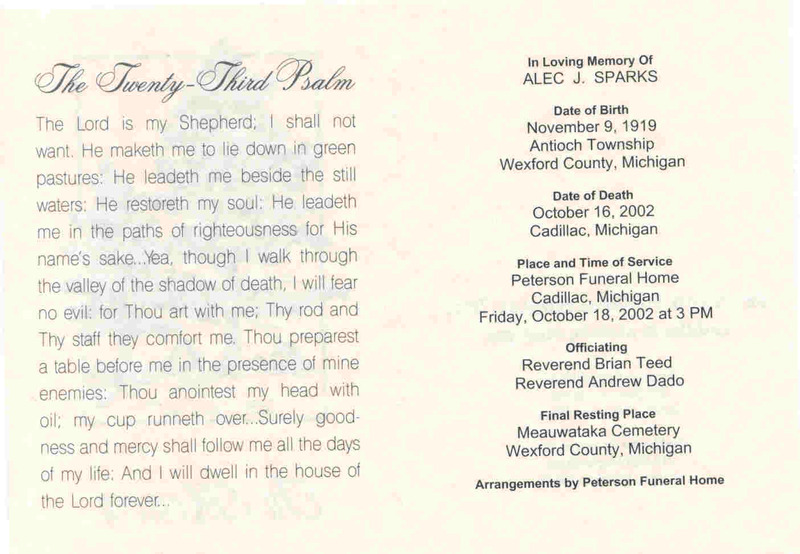 Alec Sparks was a neighbor of Papa’s family for many years, and of Papa and I when we lived in the Cadillac area. You can see that he was born in Antioch Township, Wexford County, an area where Papa’s family also had roots. Alec James Sparks was the son of James Sparks and Minnie Sayer, the second of their nine children, and the oldest to survive childhood. He loved music, and he loved to dance. He was a carpet layer, at least for some part of his career, and M-in-L sometimes asked him for advice on flooring. When our children were small, I remember taking them off to pick berries, or hunt mushrooms. We often saw Alec walking along the road, getting his exercise. The other day I got side tracked from a little job making a couple of pairs of PJ pants for GD1, and cleaned off the shelves in the back storage room. In the process I also sorted patterns, but that is another story. A few things surfaced, which I photographed for Treasure Chest posts. I remember this shoe shine kit well. I have no idea how I ended up with it, but it contains enough sentimental value to almost bring tears to my eyes. Dad was an undertaker, I guess I have mentioned that enough times. In the good old days undertakers and really all businessmen, wore suits, hats, overcoats, gloves, and leather shoes. 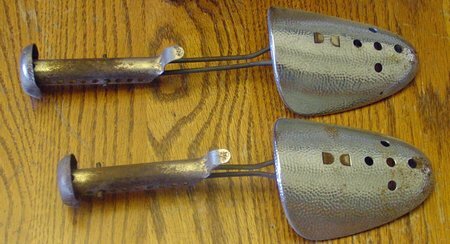 There were rubbers or zip front rubber overshoes for winter. Does anyone else remember the rubbers? they were very flexible, like rubber gloves, and fit tightly over shoes. I can close my eyes and see every adult in my childhood life leaning on the wall near the door, either putting the rubbers on, or peeling them off. They adjust from longer to shorter by putting the handle on using the correct holes. First he wiped the shoes off, then he put on the polish. For the uninitiated, the polish came in a glass bottle, with a fleecy dabber attached to the underside of the lid with a wire stick type thing. I can see him carefully spreading the polish on the shoes, holding not the shoes, but the handle of the shoe tree on which they were installed. He was meticulous, there was never any polish on the soles of the shoes, or on the floor, or his hands. The shoes were set aside on a piece of newspaper to dry, then shined with the brush. If you look at the handle, you can see it serves a dual purpose. It is ribbed, therefore not slippery. You can sit in a chair, put your foot up on the handle, and brush your shoes off, or shine them with a rag. 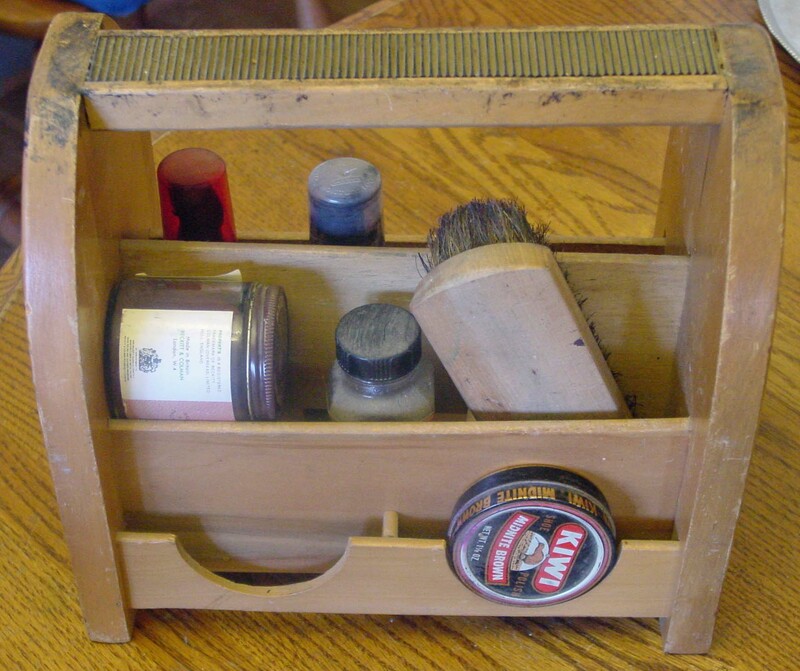 I think only the shoe trees, the brush and the box are original. The polish is all newer, and I have stored it in the kit. This post was written following the “Treasure Chest Thursday” theme over at Geneabloggers. This land is more in proximity to Papa’s Abbott and Burdick ancestors’ land. 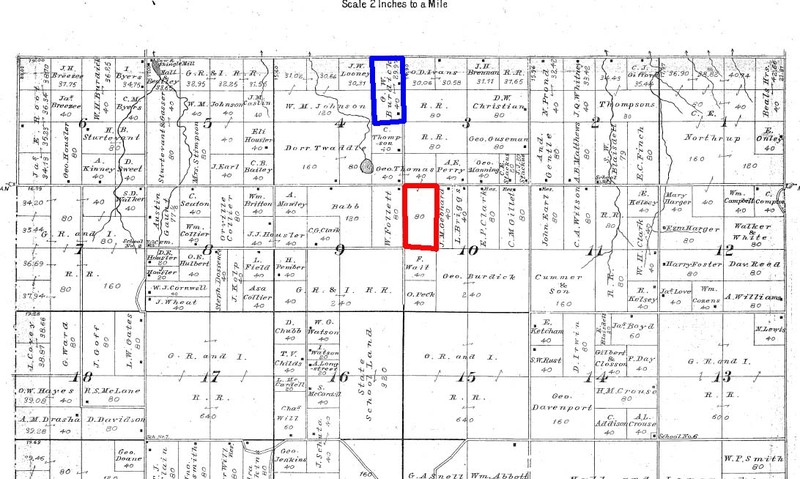 On this section of the old 1889 atlas1, the land purchased by John R. Abbott is marked in red. 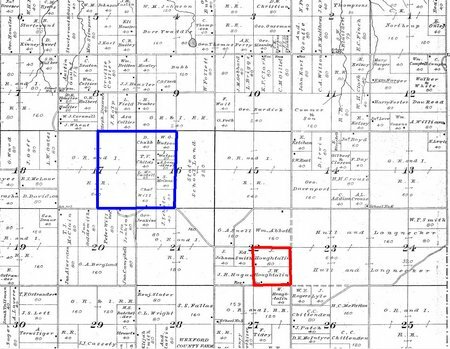 Papa’s Fenton and Fellows ancestors owned land within the blue outlined area, a little later on. Ross P. Fenton was the grandson of Mary Jane Abbott. The land owned by George Washington Burdick and wife Mary Jane Abbott was further north near the township line. 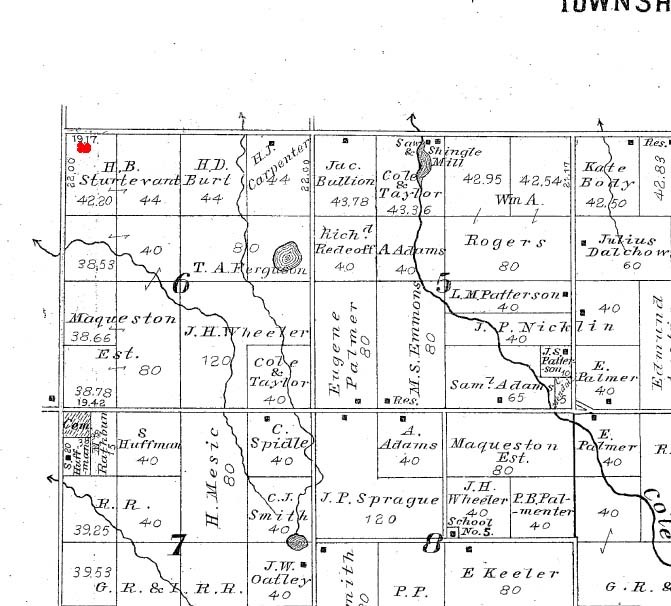 The land marked “Geo Burdick” on this map was owned by the “other” Burdick family, with whom I have not found a connection. 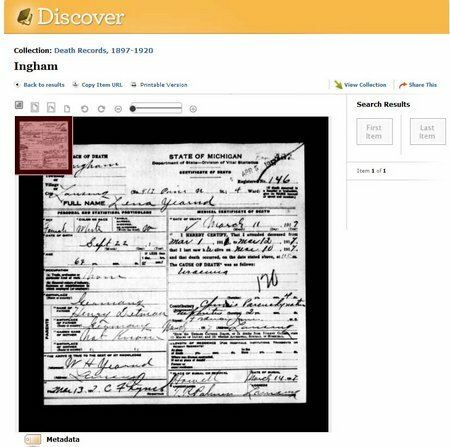 There are a host of professional genealogists who offer tips, shortcuts and tricks to make life easier for the rest of us. Along the way, each of us picks up tidbits of knowledge which help us survive, or at least become our own standard way of accomplishing tasks. Once in a while, when I feel like it, in very irregular fashion, but almost always on Tuesday, I will tell you how I do something related to my genealogy. If this little effort helps you, share with others, so they can be helped to. We all have a little something in our heads that can make life easier for others. 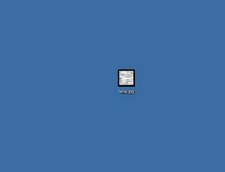 One warning: I am a PC user, and I know nothing about Apple, Mac or Linux operating systems and/or computers. This is from a PC user, for PC users. 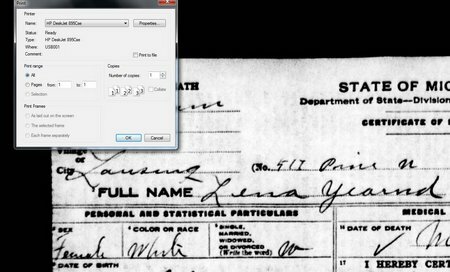 Today’s tool is a method I used to save, rather than print, records on Seeking Michigan [www.seekingmichigan.org]. I usually prefer to save files, rather than print them, and Seeking Michigan does not have a “save” button. 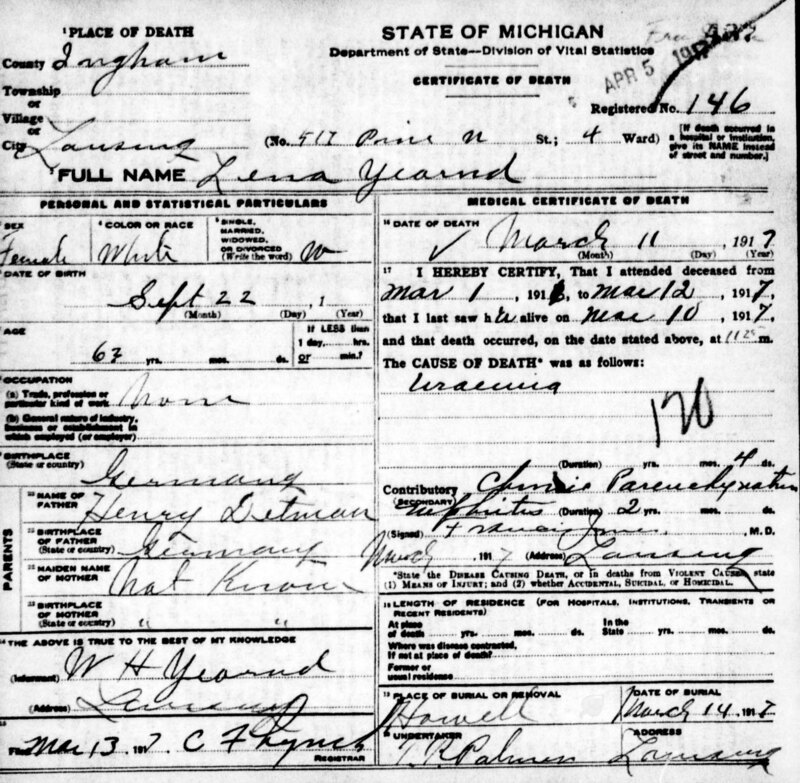 I conducted a search, and am using my great-grandmother, Lena Yearnd. 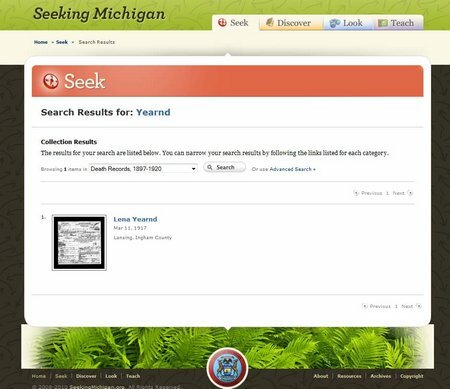 Here is the result of searching for “Yearnd”. If you are as crazy as me, you won’t want to have the record with the thick black border. That huge black border is another reason not to print, it prints out, too. Just open the image in your favorite photo editing program, and then crop off the black. Some of the images on the site are slightly crooked, you can also straighten if needed. 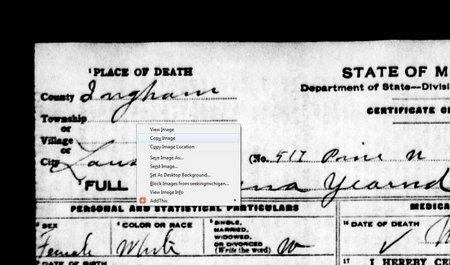 Here is a link to the resulting file, and nice clean version of my great-grandmother’s death certificate. If you know of any Detman/Detmann families in Michigan between 1870 and 1920, please contact me. Although I have no evidence Lena immigrated with her family, one never knows. I am posting information gleaned from land records in the areas where our family’s ancestors resided. You can read more about this project in the overview. You may also check my deed record listing, which I will update frequently, but probably not every day. This group pertain to early residents of Wexford County, Michigan with the surname Abbott. Papa’s second great-grandmother was Mary Jane Abbott; I have undertaken a study of the early Abbott deeds to look for connections to her and her family. I know that her brother Erastmus D. [E.D.] Abbott was in Wexford County, but have not connected any others to her at this time. On a recent trip to Wexford County, I was able to survey the earliest two deed index books for the county, which resulted in eight deeds with surname Abbott. Rec’d and recording: 22 Jul 1875 9 a.m.
Only time will tell if Ezra Abbott has any relationship to our family. 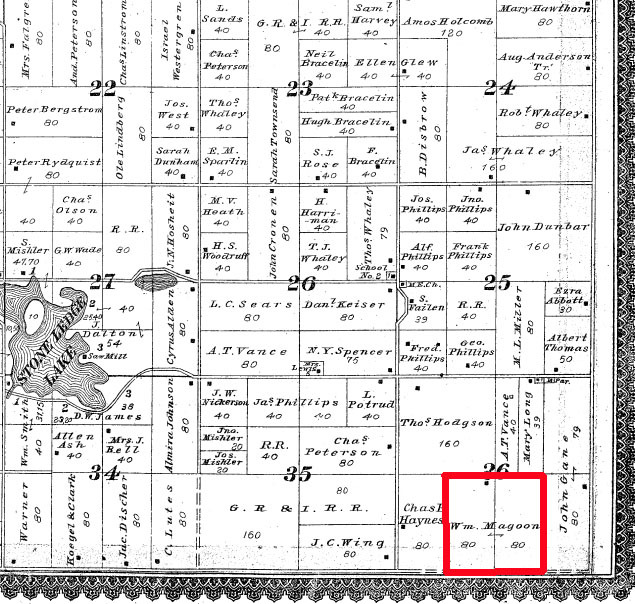 Here is the location of the land purchased by Ezra Abbott in 1875, illustrated on a small portion of the old 1889 Wexford County Atlas1, located in the extreme southeastern portion of Wexford County. 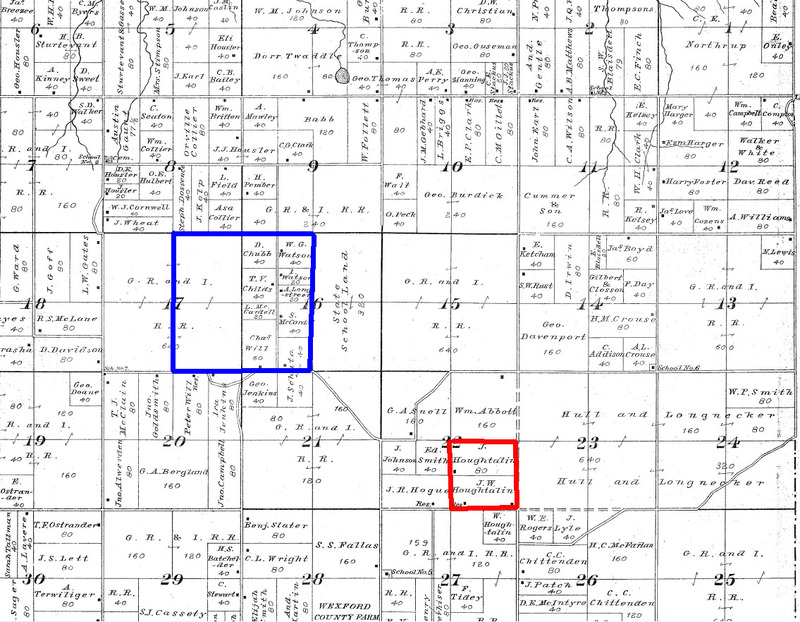 In 1889 both portions of the land were owned by one individual. E.L. Hayes & Co., Atlas of Wexford County, Michigan / compiled by Eli L. Hayes from government surveys, county and township records, and personal investigations and observations , Eli L. Hayes, (Chicago, Ill.: E.L. Hayes & Co., 1889), page 15; digital images, The University of Michigan. Michigan County Histories and Atlases. http://name.umdl.umich.edu/3928170.0001.001 : accessed 2 November 2009. Grantor: Belle Fellows of Manton, Wexford County MI surviving joint tenant of Henry H. and Belle Fellows. Description: SW 1/4 of the SW 1/4 Sec 22 T14N R14W and lots 4,5,6,8,9,10,11,12,13 a cording to the village plat of Denver. Henry H. Fellows died 19 September 1905 at the hospital in Big Rapids, Mecosta Co., Michigan. Belle had the need for some cash; apparently she sold her Newaygo County property to obtain it. The village of Denver was located just north of the 40 acres owned by Henry and Belle. 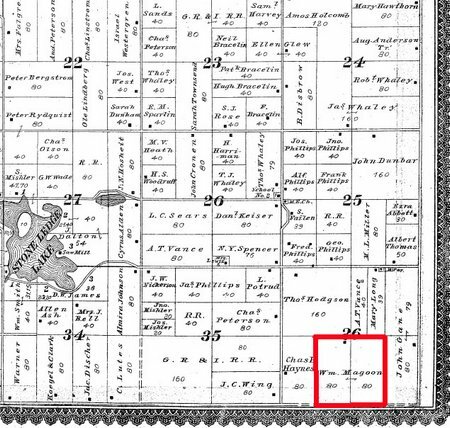 You can click on the thumbnail to better see the location of the land is illustrated on the Ashland Township map from the old Newaygo County Atlas1 . C. O. Titus, Atlas of Newaygo County, Michigan / compiled and drawn for the publisher by E. L. Hayes ; H. H. Avery, assistant, W. B. Patterson, assistant. (Philadelphia, PA : C.O. Titus c1880), page 57, The University of Michigan. Michigan County Histories and Atlases. http://name.umdl.umich.edu/3927793.0001.001 : accessed 15 February 2010. 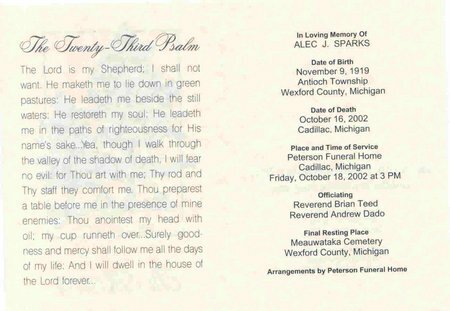 I am sharing funeral cards on Fridays, following a Facebook meme which you an see here. I know the meme was for “First Fridays, but I have quite a few, and I like to move ahead when I hear a good idea. Today’s card is from the service of Papa’s grandmother, Edna Rose Fellows. You can click to enlarge the card. Edna Rose Fellows was born on 2 December 1892 in Newaygo County, Michigan. Her parents were Henry H. Fellows and wife Belle Lamunion. Edna was the seventh child of Henry and Belle. Edna married Ross P. Fenton on 11 Sept 1909, and they raised a family of six children. You can see a photo of Edna’s final resting place in my cemetery series.